[QUOTE=tp81;15004654]My car has finally arrived in sunny Scotland. I knew before my salesman thanks to the Porsche car connect. Due for collection on moday. I had to stop in and see it and check the boot space with the Burmester, this has really been the only thing I have been unsure off and unable to get any real guidance from the dealer. The official response was - You will loose some space but not sure how much. I know this has been discussed in the past, but has anyone actually seen 30+ miles range displayed after a full battery charge? For me, after a full night charge my e-power range is only displaying between 22 - 24 miles, and this morning it only displayed 20 miles!!?? Should I be concerned with my battery capacity? I've put ~700 miles on the car, mostly with city/stop and go traffic (Chicago) driving, and the charger is plugged into a normal 110V outlet (takes a long time to fully charge I know..about 10 - 14 hours). I know people have talked about "conditioning" the battery in the past, but I rarely go on long drives, so it would be difficult for me to do that. I'm sure the dealer will just write this off as "normal behavior". Thoughts anyone? I did "condition" my battery on the long drive up from LA to South Bay Area. I ran it all the way down and then switched to Sport + to charge it back up. Did this repeatedly all the way (~400 miles) home. Since then I've just been driving mostly in electric mode and recharging when I get home. This morning the charger indicated 28 miles (highest yet) but shortly after leaving home it dropped to 26 miles. I did an 8 mile stretch on the freeway followed by a 6 mile stretch on a 50-55 highway with stoplights, played golf, then drove back home, about 14 more miles but only made it halfway. So actual mileage on electricity was 21 miles. May be due to 70 mph on the freeway stretches going and coming back? Anyway, actual electric mileage so far is not equal to that indicated after full charge. I am charging on 240V and it only takes a few hours to charge up. I don't understand the Hybrid seem to have the same engine as the 4S yet it puts out only 330 HP? It has been referred to as a "detuned" version of the 2.9L engine. Not sure if that is correct or not?? I did also see a post in which they speculated that the turbos on the E-Hybrid are not the same as those on the 4S. Either way, I believe Porsche really wants the 4 E-Hybrid to be successful and it is priced accordingly between the Base Model and the 4S. If they hadn't "detuned" it then the HP would have been 572 instead of 462 and then the 4S being priced higher wouldn't have made any sense in their lineup. All of the above is just speculation on my part, but sometime in the future there will be a more detailed explanation. Would be nice to have another 90 HP but really not necessary. The 4 E-Hybrid is plenty fast!! Driving back from Monterey this evening I noticed the left sideview mirror shows a reflection of the dash where the headlight switches are located. I found this somewhat disturbing as I thought I was seeing something there when I glanced and then realized it was just a reflection. I'm thinking I need to turn down the brightness of the overall dashboard lights. I haven't changed them from the "default" settings. Has anyone else noticed this reflection at night in the left sideview mirror? Yeah its a bit disappointing, would be nice to see, and be able to say the ICE mileage when moving the car on. How hot does folk's oil get? I was a little surprised to see my oil on a fairly gentle autoroute journey on a day with an ambient of around 20ºC, getting up to 104ºC. The oil temperature on my 997 Turbo S never went over 95º even with very high speed cruising on German Autobahns. The oil temperature on my 1977 3.3L RSR even on competition use, never goes over 95º, albeit that has a very large 72 row oil cooler in the middle of front splitter/apron. The oil pressure on the E-Hybrid seems low as well at 21psi or 1.44 bar at 2000 RPM in 8th gear. I have now done around 4000 km in the vehicle. The oil pressure on my 997 was always up around 4 to 5 bar. Wilson, I forget (too many posts here to look through! ): were you one of the owners with the "check engine" light problem? Yes due to the "Oil overfilled" problem. This was almost certainly due to driving the car too gently with short runs for the first 700 odd miles in cold and wet weather, which caused excess fuelling and condensation contamination of the oil. I just hope that did not cause any main bearing damage, which could result in the high oil temperatures and low oil pressure problems I am seeing. Given that the Panamera uses full synthetic oil, I would think this is very unlikely. I might however, send an email to my UK dealer (I am at my French house at present), just so that this is on record. What oil temperatures and pressure do you see? My new Pan4 ST E-Hybrid has just arrived at the dealership, but alas, I am travelling a thousand miles from home at the present. I will see it and drive it first on Thursday and Friday of this week, and then take final possession of it next week. I'll post some information on my findings with respect to the ongoing discussions here in the coming days and weeks. When I took delivery of the car, I reset the "trip" odometer. By using the various trip odometer, it shows how many miles have been driven on electricity alone. So, the subtraction of the total trip - e-trip should equal how many miles ICE has been used. I have been trying to get the highest mpg since getting the car. (except for a 2 nights where I tried the e-Launch control and many 0-50 runs to see how fast it is and the different ways to launch. Even with many hard launches, I still drove home and it said 20mpg. Once I get bored of this mpg game, I will start to rev the car up in the future. Yes, Lefty, I have the same reflection. I decided that I would rather have my switches more visible than turn them down to the level to avoid the reflection. Nothing is ever perfect...lol. FYI - Just received this text from my dealer regarding 2019 orders. "So I called our GSM to confirm. He said something is going on with Panamera and Macans right now. 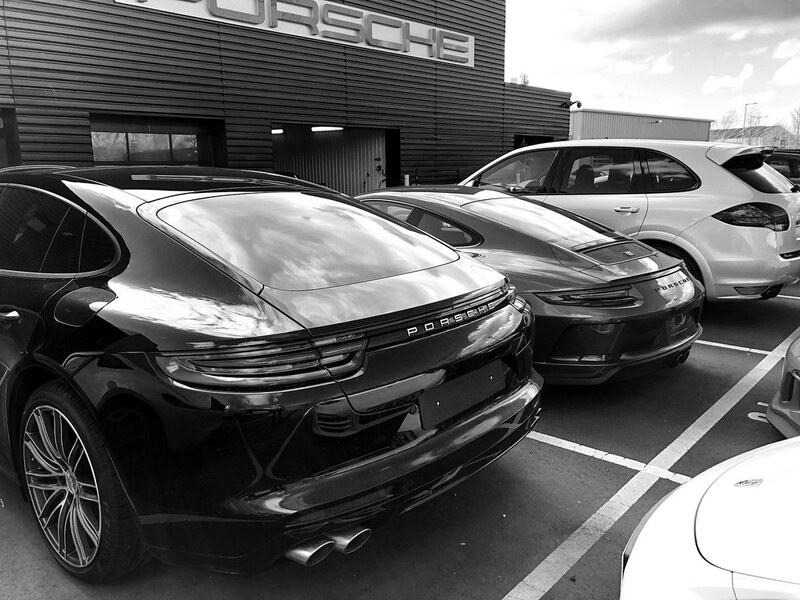 Says we wont see 2019 Panamera/ Macans until December/January."